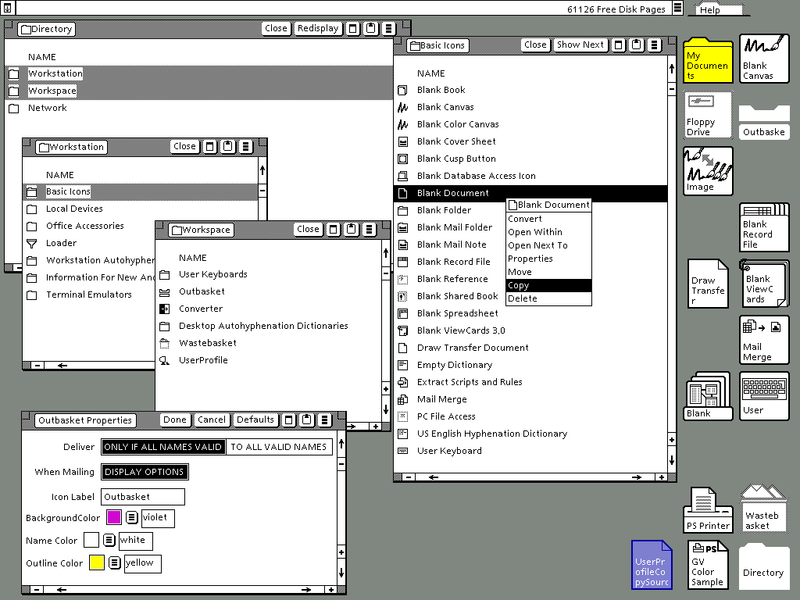 GlobalView 2.1, released in 1996, is the descendant of the Xerox Star ViewPoint desktop software. The Xerox Star was the 1981 commercial successor to the Xerox Alto. The Xerox Star and GlobalView were primarily sold as a document processing system although they could do much more. 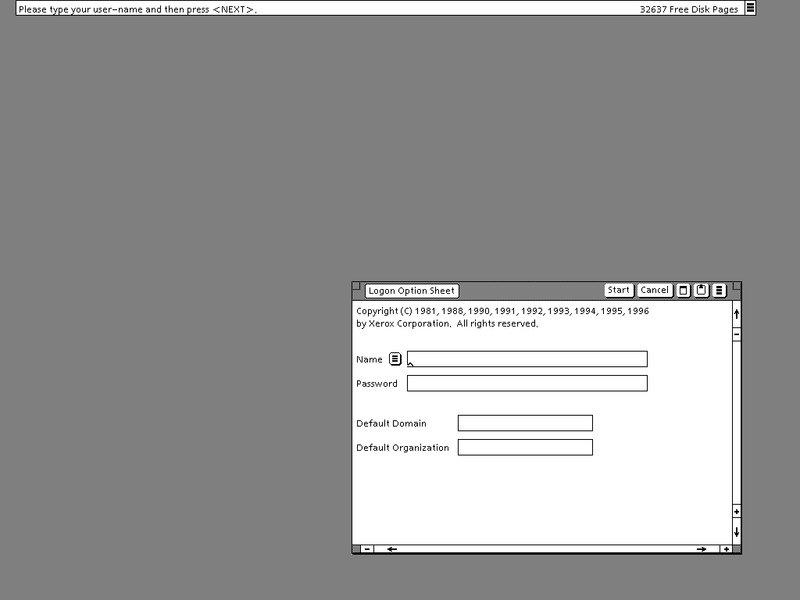 GlobalView runs on an IBM-PC compatible under Microsoft Windows (3.1, 95, 98, possibly ME but not NT, 2000, or XP due to the use of .386 VXDs). 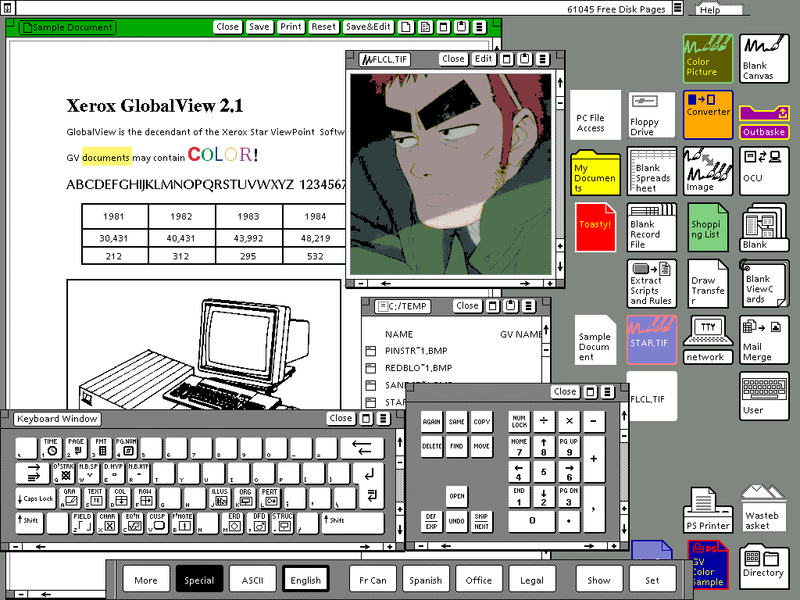 For all practical purposes GlobalView is not a Windows application, it is essentially the Xerox Star desktop and OS software running in an emulator. Earlier versions of GlobalView required a hardware MESA CPU add-on board, however this version uses a software emulator. When starting GlobalView for the first time it may take a little while to start up as it "boots". Eventually it will display the login screen. It appears this login is supposed to authenticate with a network. Regrettably I do not happen to have a Xerox 8000 series server laying around. GlobalView is capable of talking to a Xerox network using the PC's ethernet adapter if a DOS mode network card driver is installed. Without a network present it creates a local workspace and allows the login to proceed. This is the default desktop appearance. Ouch! A purple background? For the rest of these screen shots I will set the background to gray so I don't burn out my eyes. This screen shot shows GlobalView in action. 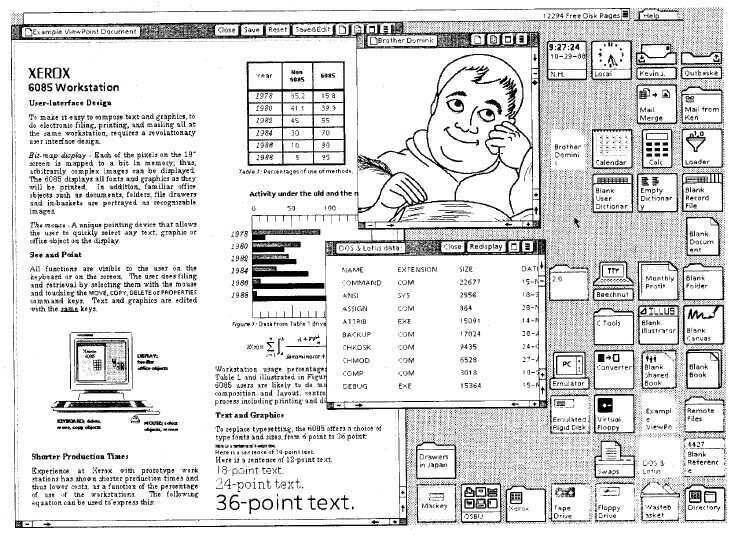 GlobalView is very similar in appearance and functionality to ViewPoint that ran on Xerox Star workstations. There are, obviously, some GlobalView specific additions such as color support and PC drive access. 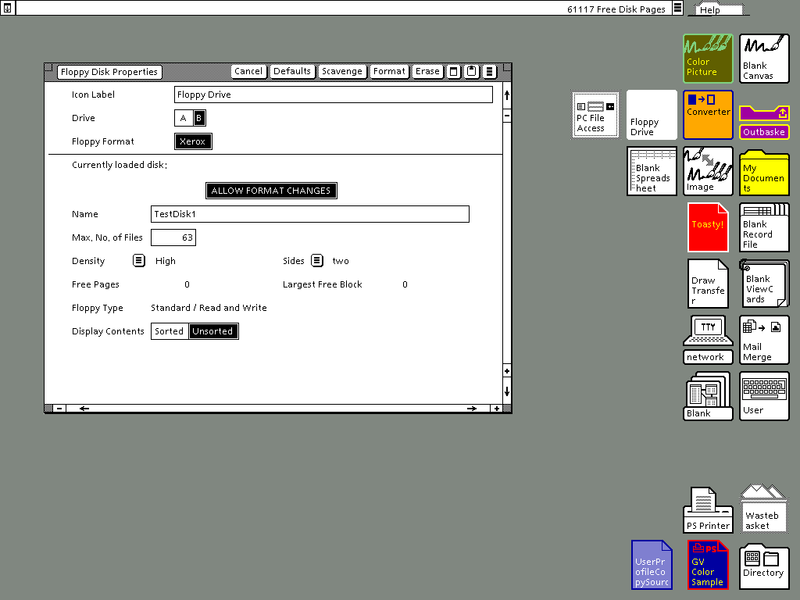 GlobalView is really a very well designed GUI, especially considering it was designed back before Windows, the Macintosh, or even the Apple Lisa. However, if you are used to using more modern GUIs, then GlobalView may feel kind of odd, clunky, or even backwards. There is nothing really wrong with the design, but many of the ways things are done in GlobalView are different from the way things are done today. Instead of having window borders that can be grabbed to resize, each window has a "resize" box in each corner of the window. Common options buttons such as "save", "apply", "done", or "close" are placed on the title bar. . Instead of using popup message boxes or alerts, GlobalView has a single message box located at the top of the screen that is always present. There seem to be no radio buttons or check boxes, although regular buttons are made to serve the same purpose. Documents open in "read-only" mode. An "edit" button must be clicked before changes can be made to a document. 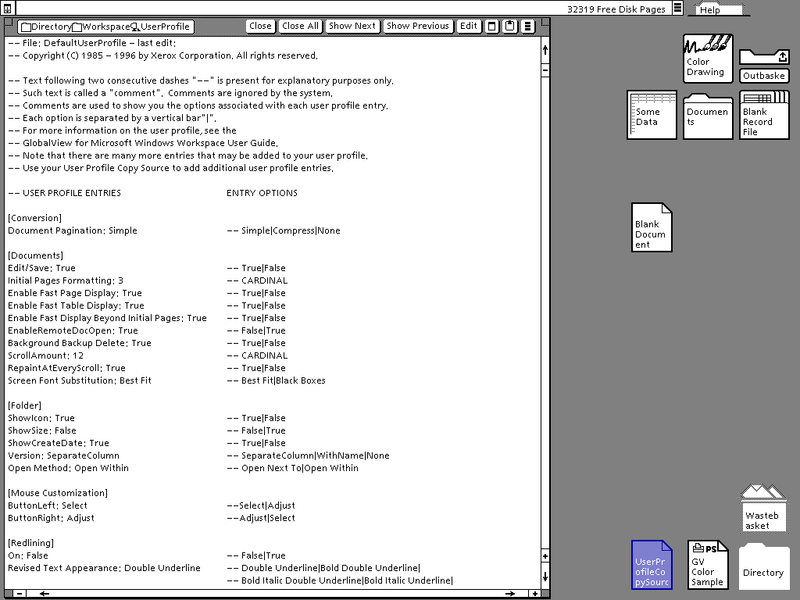 Context menus are brought up by clicking both the left and right mouse buttons at the same time to simulate clicking a third middle mouse button that was present on original Xerox Star mice. Windows are minimized or set aside by middle clicking and selecting an icon/button that appears. Clicking on the box in the upper left of the screen will then display a list of all minimized windows. There is no such thing here as a "grayed out" menu option. GlobalView will let you try to pick any menu option even if is not applicable and will then display an error message if it wasn't applicable. GV Write is the word processor included with GlobalView. Its more notable features include resizable fonts, non-English fonts including Arabic and Japanese, tables, drawing areas, insertable bitmaps, "redlining" document change management, and colored objects. Although it is graphical, GV Write is heavily keyboard based. Various "special" key combinations must be used to access most of its features. There are no graphical menus or tool bars that can be used in place of using the keyboard commands. This screen shot shows the various folders present. These can be accessed by double clicking the "directory" icon (shown here in the lower right of the screen). The Directory folder contains the "Workstation", "Workspace", and "Network" folders. The Network folder is reportedly somewhat similar the Windows Network Neighborhood, however I have no Xerox network to test this with. The Workspace folder contains files and settings that are specific to the current user. This is similar to a user profile under Windows. The Workstation folder contains files used by all users on the specific computer. The most important folder in here is the "Basic Icons" folder which contains document templates for all types of documents that can be worked with on the system. You would middle-click on the icon, select "copy" and then drag the cursor icon to location to create the new document. This screen shot also shows the property sheet for an icon where the text, background, and outline color can be specified. 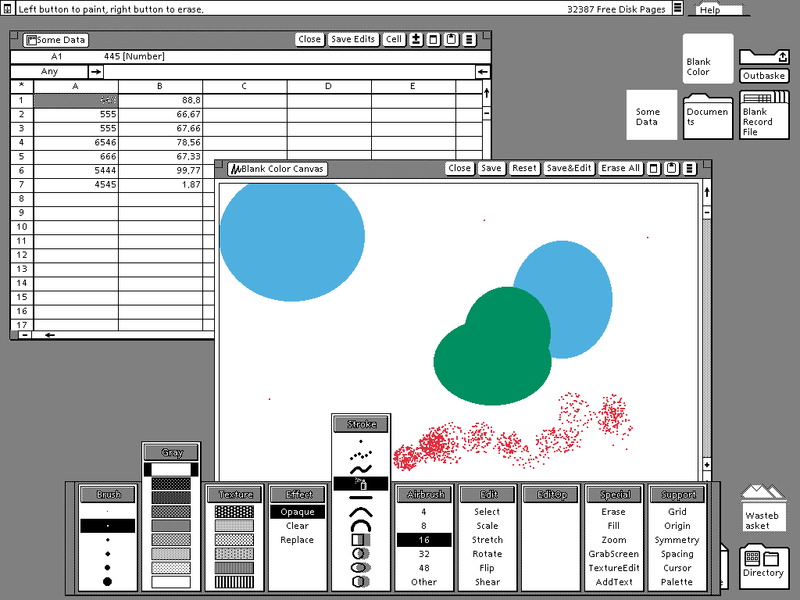 This screen shots shows the spread sheet application, GV Calc, and the drawing application, GV Draw. GV Draw uses an interesting kind of "dock" for tool selection. 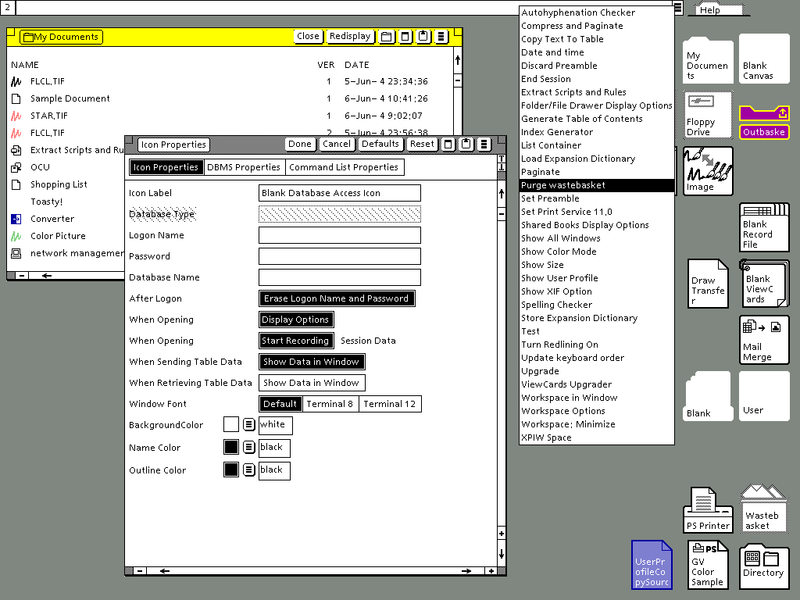 This reminds me of the Solaris / CDE menu toolbar. 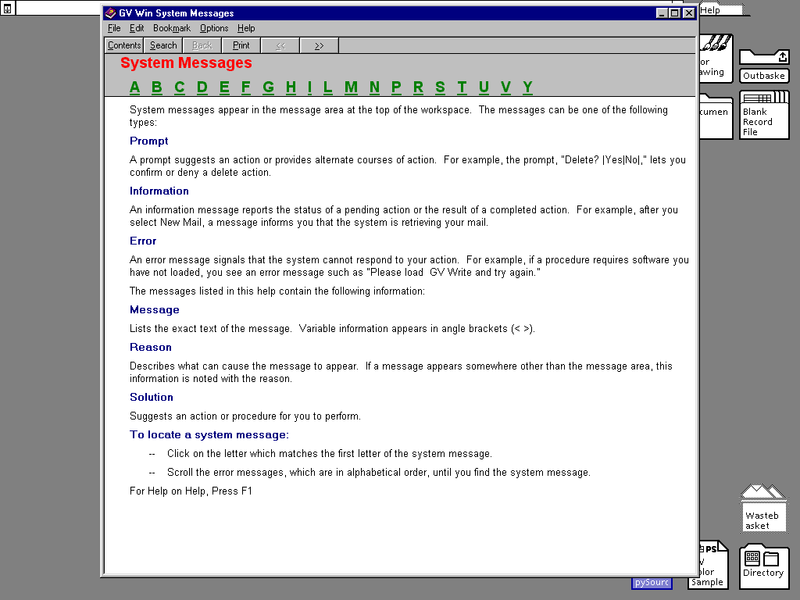 This screen shot shows the menu that appears when you click on the message box at the top of the screen. This contains many options that are applicable to different applications. This is also where you go to log off, and empty the wastebasket. Some property sheets, such as this one, are interesting as they behave like a tabbed dialog box. Also interesting, the title bar of a folder or document is drawn the same color as the background color of the icon. This behavior does not seem to be consistent between all applications, however. Help files and a quick tour program can be launched from the help icon in the upper right of the screen. Oddly, the help uses the Windows help system rather than being built in to GlobalView. The quick tour demo is also a Windows application. 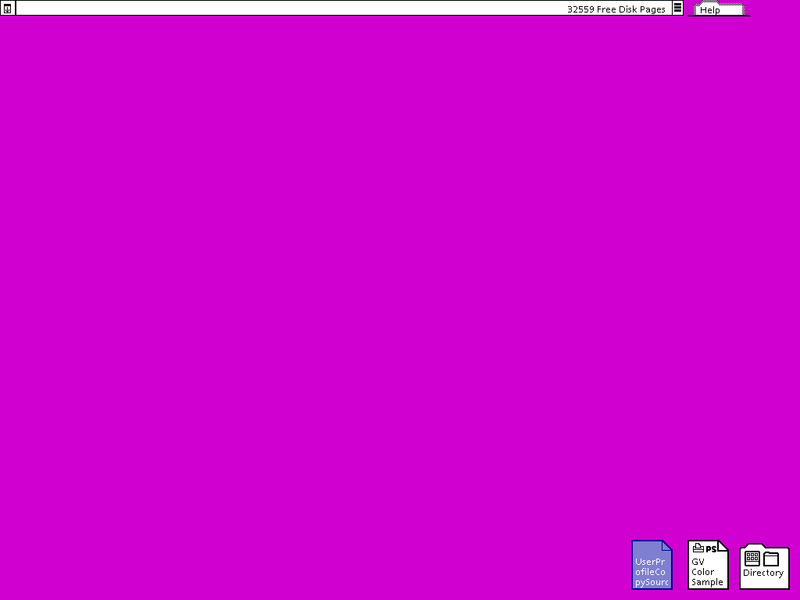 Other than this, when using GlobalView in full screen you can almost forget you are running Windows. Despite being a GUI, workspace preferences are stored in a text file. You have to change certain settings like the background color here to make them permanent. It seems that GlobalView can read, write, and format Xerox formatted floppy disks. Presumably this is the same format used on real Xerox Star workstations. Logging out of GlobalView. This is a bit quirky as it tries to avoid the long boot up by saving the state of the emulator to disk so it comes up at the same point the next time you start GlobalView. This means it doesn't actually get rebooted and apparently it needs it from time to time.